TRANSPORTATION has been of vital importance to Cleveland–a principal factor that explains why the city grew into a major metropolis. Initially, that meant Cleveland’s access to water; a town site along the mouth of the CUYAHOGA RIVER made real sense. Much of the community’s early history involved LAKE TRANSPORTATION, with scores of sailing schooners, brigs, and barks that transported intercity cargos. Eventually, steam-powered vessels appeared, and quickly took over much of the carrying trade. The first steamboat on the Great Lakes, the 330-ton WALK-IN-THE-WATER, made its maiden voyage in 1818; by 1840 more than 60 steamboats served the lakes, and many called at Cleveland’s docks. These vessels were faster, and in most cases could carry bigger payloads, than their wind-driven counterparts. The value of the Great Lakes to Cleveland also increased because of internal improvements to these waterways–lighthouses, deeper harbors and channels and the like–made them more useful to shipping interests. The opening of the Welland Canal between Lake Ontario and Lake Erie in Nov. 1829 enhanced the overall value of the Great Lakes to Cleveland, and construction in the 1850s of the Sault Canal around the falls of the St. Mary’s River at the foot of Lake Superior had an even more pronounced effect. Most of all, the city’s iron and steel industry blossomed. The basic components of these metals–iron ore and limestone–could be transported to sites along the Cuyahoga River by an inexpensive all-water route from the Lake Superior country. While heavy cargoes dominated Lake Erie commerce, especially after the Civil War, boats also carried people. Daily passenger service between Buffalo and Detroit via Cleveland began in 1830, and the “Forest City” became home port to several of the leading Great Lakes passenger carriers. As late as the first quarter of the 20th century, the Detroit & Cleveland Navigation Co. and the CLEVELAND & BUFFALO TRANSIT CO. boomed the merits of pleasure and overnight business trips by water: “Spacious stateroom and parlors combined with the quietness with which the boats are operated ensures refreshing sleep.” But by World War II, the automobile and airplane–the same transportation forms that would greatly reduce intercity rail passenger travel–virtually killed lake passenger service, and the piers at the foot of E. 9th St. became quiet. Modernization also affected freight-carrying vessels on the lake. Great “fresh-water whales”–the long bulk carriers–appeared early in the century and continued the tradition of transporting raw materials to Cleveland plants. By the 1960s these distinctive boats shared water space with oceangoing ships. Completion of the artificial channels and locks of the St. Lawrence Seaway project in 1959 made the latter’s entry possible, and thus Cleveland became an ocean port. The mariner’s map of the world had been altered significantly. While an evolutionary process was at work on the Great Lakes, Cleveland’s other important water route, the OHIO AND ERIE CANAL, eventually stopped being a transportation artery, but not for several generations after its opening. Even though Cleveland’s population in 1820 totaled only 606, it could still rightfully claim to be a premier lake port. Therefore, state officials wisely selected the community during the early 1820s to be the northern terminus of the projected 308-mi. canal. When completed in 1832, the “Great Ditch” linked Lake Erie at Cleveland with the Ohio River near Portsmouth. A usage pattern somewhat resembling the one seen for lake commerce characterized the Ohio Canal. At first both “hogs and humans” traveled this waterway; the latter boarded specially fitted packets. Admittedly, it was smoother than the ride provided by the various stagecoach lines, but canal travel was extremely slow and unavailable during cold weather or occasional flooding. This means of transportation reached its zenith in the 1840s but declined dramatically with the advent of railroads. Freight, which included wheat, flour, whiskey, pork, salt, limestone, and coal, continued to move by canal long after packets disappeared. Even as late as 1900, the low rates charged by boat owners still attracted bulk cargoes, mostly coal, from east-central Ohio into the ClevelandFLATS. But eventually railroads, in particular the Cleveland Terminal & Valley, conquered the venerable Ohio Canal. Steam RAILROADS revolutionized Cleveland transportation. By the outbreak of the Civil War, only a dozen years after the arrival of the first steam locomotive, this means of intercity transport was firmly established. The vast majority of people selected railroads for personal travel and to meet their shipping needs. All recognized that water competitors were slow and were universally susceptible to the vagaries of the weather, especially thick winter ice. Furthermore, the railroad offered convenience; businesses tended to choose a railroad rather than a water location. By the post-Civil War era, the flanged wheel had become virtually synonymous with transportation. Yet the Railway Age did not last forever. The first major challenge to the dominance of steam trains came with the introduction of the electric INTERURBANS. Clevelanders in 1895 could brag that they had one of the country’s first intercity traction lines, the Akron, Bedford & Cleveland Railroad. Within a decade, residents had the services of a half-dozen interurban systems that radiated out of the city to the east, south, and west. Interurbans, with their frequent runs, attractive rates, and noticeable cleanliness, siphoned off tens of thousands of potential steam railroad patrons, and captured much of the highly profitable package express and less-than-carload freight business. At times the Cleveland-area steam roads slashed charges or increased trips, but usually they let the interurbans have much of the traffic. Just as steam railroads showed their vulnerability to interurbans, the latter proved to be even more susceptible to competition. Gasoline-powered vehicles speedily replaced those propelled by electricity. After the dawn of the 20th century, Cleveland emerged as a major center of the AUTOMOTIVE INDUSTRY, and per capita ownership of the horseless carriage soared. In 1916, for example, Cuyahoga County’s automobile registrations totaled 61,000; 10 years later the figure stood at 211,000. Cleveland’s long-standing ties to the automobile are represented nicely in the career of resident Frank B. Stearns (1878-1955). In 1898 Stearns launched a manufacturing concern, the F. B. STEARNS CO., to build automobiles of his own design and established himself as an important American automobile maker. He also participated in several road races to demonstrate the remarkable potential of this new method of transport. In Jan. 1900 he helped found the Cleveland Automobile Club, the nucleus of the powerful and influential American Automobile Assn. (see OHIO MOTORISTS ASSN.). Services offered by the Cleveland Automobile Club helped expand automobile usage in the area by the 1930s. Better roads stimulated automobile sales after World War I, and they also did much to encourage expansion of bus and trucking operations. Cleveland’s early intercity bus companies operated relatively short routes; in fact, their system maps closely resembled interurban maps. In 1925, for example, travelers could board vehicles of the Cleveland-Ashtabula-Conneaut Bus Co. on PUBLIC SQUARE for travel to these communities and numerous intermediate points; they might select a run of the Cleveland-Akron-Canton Bus Co., a carrier that followed much of the route of the Northern Ohio Traction & Light Co., or they could opt for buses of the Cleveland-Warren-Youngstown Stage Co., among others. In the 1930s these smaller firms gave way to larger ones. The Cleveland-based Buckeye Stage System served Columbus, Cincinnati, Elyria, and Sandusky; and the Cleveland-based Central Greyhound, associated with Greyhound Lines, operated throughout the eastern Midwest. The remaining smaller operators eventually either folded or merged with Greyhound or its major rival, Continental Trailways. Ultimately, in the 1980s both of these bus giants became one firm. Although Cleveland never evolved into the region’s leading motor-carrier center, it benefited enormously from the steady growth of this transportation form. But in terms of truck production and truck transport, Cleveland profited greatly from the early innovations of the WHITE MOTOR CORP., which sent 5 experimental trucks in 1902 on a successful round-trip run from New York City to Boston. That company, which for several decades was Cleveland’s largest independent manufacturer in any field, remained in the forefront of truck development and production and also sported a sizable bus-building division. Small trucking concerns, often equipped with White vehicles, appeared before World War I; most provided intracity cartage. But with the triumph of the state’s good-roads movement in the 1920s and early 1930s, and subsequent heavy spending by Congress on federal highways, companies became regional and even interregional in scope. Clevelanders, though, could smile about their good fortune with AVIATION. Throughout the life of commercial aviation, the city benefited from virtually unequaled air service. Even prior to regularly scheduled passenger operations, Cleveland and a select number of other places enjoyed access to airmail flights. When the public began to travel by air after the mid-1920s, the local terminal never lacked for carriers. In the 1930s a number of companies provided service, but by World War II only 3 dominated: American, Pennsylvania-Central (subsequently Capital and then United) and Central itself. While regulators in the late 1940s opened the city to other strong firms, the number of carriers remained stable. Deregulation in 1978, however, ushered in a plethora of companies, and Cleveland became more of a “hub” operation. United, Cleveland’s largest airline, gradually left the area, and USAir and Continental replaced it as the primary carriers operating out of Hopkins Airport. Passengers who used CLEVELAND-HOPKINS INTERNATIONAL AIRPORT after the early 1960s enjoyed easy access to Public Square and other east and west side locations, for Cleveland could claim to be the city with the first rapid-transit line connecting its airport to the downtown area. The Cleveland Transit System (later the GREATER CLEVELAND REGIONAL TRANSIT AUTHORITY) was merely the latest operator of Cleveland’s surface rail network. Like most sister cities, Cleveland experienced all types of intracity transportation (see URBAN TRANSPORTATION). The earliest rolling stock to appear on its streets was the horse-drawn omnibus, the 19th century forerunner of the taxi. Omnibus runs started in 1857 and connected the railroad station and lake docks with various public houses. Soon though, the horse (and occasionally the mule) pulled an omnibus-type car on flanged wheels over light rails fixed in the streets. By the Civil War, these “streetcars” rolled on EUCLID AVE.. as far as Erie ( E. 9th) St., turning south on Prospect Ave. and east to the corporation limits. While horse lines flourished in the postwar period, they disappeared in the 1890s. Most communities with horsecars converted to the much more efficient and economical electric trolleys introduced in 1887. While this transformation likewise occurred in Cleveland, an intermediate phase took place, the cable car phenomenon of the 1880s and early 1890s. Cleveland joined such places as Chicago, Cincinnati, Kansas City, and St. Louis in using cable cars. While inferior overall to the future trolley, the cable car was more desirable than the horsecar, largely because of its greater speed and lower operating cost. In the 1890s Cleveland’s 261,000 citizens rode cars belonging to the Cleveland City Cable Railway from UNION DEPOT up Water (W. 9th) St., and then east on Superior Ave.; or they could change to the Payne Ave. line that continued eastward to Lexington and Hough avenues. In 1893 the CCC became part of MARCUS HANNA†’s WOODLAND AVE. AND WEST SIDE RAILWAY CO., which took the name Cleveland City Railway. The cable lines continued to run throughout the 1890s, even though the faster and more reliable electric cars spread quickly throughout the city. The higher costs of cable operation and the difficulty of expansion led to conversion of the Superior line to trolleys in 1900; the remainder of the system met a similar fate a year later. Not only did Cleveland’s developing electric streetcars spell doom for the horse and cable cars, but the substantial profit potential and the high capitalization requirements led to the unification of various electric lines in 1893. The result was the creation of 2, at times competing, systems, the CLEVELAND ELECTRIC RAILWAY CO. and the Cleveland City Railway Co. The local press called the former the “Big Consolidated” and the latter the “Little Consolidated,” which common parlance soon shortened to “Big Con” and “Little Con.” The urge to form a private monopoly led to merger of the “Big Con” and “Little Con” in 1903, creating “ConCon.” Although the city finally had its streetcar lines under a single management, consumers wanted a 3-cent fare, not the prevailing charge of 5 cents. Progressive mayor TOM L. JOHNSON† led the battle for a permanent solution to the “streetcar problem”–MUNICIPAL OWNERSHIP. During the Johnson years, reformers repeatedly fought “ConCon” over the fare issue through such consumer-sensitive alternative car lines as the Forest City Railway Co. (1903), Municipal Traction Co. (1906), Low Fare Railway Co. (1906), and Neutral St. Railway Co. (1908). With the establishment of the CLEVELAND RAILWAY CO. in 1910, a prolonged period of reasonable rates ensued, but true public control did not occur until 1942, when the CRC was purchased by the City of Cleveland and became the Cleveland Transit System. The same technological change that affected the nature of 20th-century intercity travel likewise affected urban transit. “Jitney” buses invaded Cleveland streets before World War I but usually could not compete with the 3-cent trolley fares. Conventional buses joined the Cleveland Railway Co.’s transportation fleet during the 1920s, and eventually the trolley disappeared from Cleveland’s streets; the last streetcar rattled into its car barn from its Madison Ave. run on 24 Jan. 1954. Yet the use of rail transit did not end. The SHAKER HEIGHTS light rail line had since 1914 carried thousands of patrons daily (seeSHAKER HEIGHTS RAPID TRANSIT). Then in 1948, Mayor THOMAS A. BURKE† obtained a commitment from the federal government’s Reconstruction Finance Corp. to buy City of Cleveland revenue bonds to build a crosstown rapid-transit network. After a charter amendment gave an expanded transit board the necessary authority to manage such an operation, the Reconstruction Finance Corp. made the loan for $29.5 million in July 1951. Ground was broken on 4 Feb. 1952, and by the mid-1950s the “rapid” connected Windermere on the east side with W. 117th St. and Madison on the west side, through Terminal Tower on Public Square, and it entered the airport a decade later. In 1975 a revamping of the city’s transit system produced the Regional Transit Authority, which included the Shaker Hts. Rapid; thus the area’s rail and bus operations came under one governing body. During the 1980s, however, the continued exodus of population from the central city has reduced passenger travel on RTA. In 1994 the Gateway project, new home to the CLEVELAND INDIANS and the CLEVELAND CAVALIERS was directly connected with RTA at TOWER CITY CENTER and its use by fans was expected to improve the system’s ridership. While competition between the various modes had characterized much of Cleveland’s transportation, the complete picture reveals striking examples of coordination and cooperation between transport forms. Obviously, intracity transit operations historically have united local stations and terminals. Trucks and buses, too, have served as vital links in the transportation chain. Less apparent have been the ties between the intracity water, rail, and air carriers. Steam railroads almost from their inception have made connections with lake vessels, especially those that hauled bulk commodities such as coal. In time interurbans offered interchange arrangements with passenger boats. The Northern Ohio Traction Co. established through tariffs for travelers on its system who were bound for Great Lakes cities on the Cleveland & Buffalo or Detroit & Cleveland boats. In the same vein, the NICKEL PLATE ROAD, virtually alone among Cleveland steam roads, promoted steam-electric railroad interchange of freight. A company advertisement in the early 1920s announced proudly: “A physical connection is made with the Nickel Plate Railroad at Cleveland, which permits the movement of Electric Railway Freight Cars into the Nickel Plate Freight terminal for the interchange of both carload and less-than-carload freight.” Like the Nickel Plate, the interurbans were hungry for any type of revenue business, and they commonly established remarkably creative relationships with other types of transport. The most fascinating are 2 traction companies’ dealings with the infant airline industry. In Feb. 1926, officials of the Northern Ohio Traction Co. inaugurated “Freight Aeroplane Service.” Package freight (largely automobile-related) moved by interurban to Cleveland, and then was trucked to the airport for a flight via the “New Ford Air Mail Service” to Detroit. Two years later, on 28 May 1928, the Cleveland & Southwestern claimed to be the first railroad in the nation to offer a through coordinated rail-air service. Interurban passengers purchased a Cleveland-to-Detroit airplane ticket on STOUT AIR SERVICES, INC. from any of 10 stations: Oberlin, Elyria, Wellington, Medina, Wooster, Ashland, Mansfield, Crestline, Galion, or Bucyrus. Ultimately, the automobile and the motor truck reduced the service given by most of the incumbent forms of public transportation. 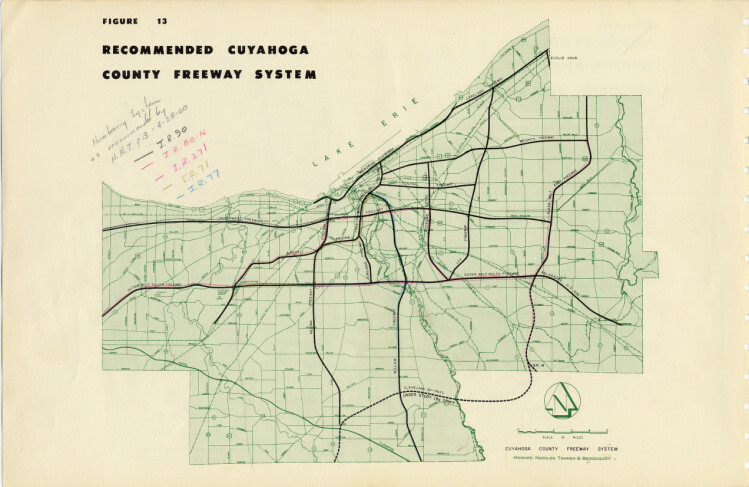 Since the 1930s, these have been the modes that have altered dramatically the landscape of Cleveland and America; they have truly made the 20th century “the age of the rubber tire.” Cleveland, of course, has continued to benefit from those old 19th-century traffic arteries, Lake Erie boats, and the railroads. Moreover, it has exploited well the advantages of air service. Cleveland remains one of the best-served places in the nation. BRIDGES. Cleveland, split firmly though unequally by the CUYAHOGA RIVER, is deeply dependent on bridges. The city’s east and west sides are joined today by both high fixed spans and lower-level opening bridges. Trains cannot climb steep grades, and their frequency of crossing is low enough to permit the use of opening spans of various sorts. Auto and truck traffic, however, is of such high density that delays occasioned by spans opening for river traffic would be intolerable. Autos and trucks are capable of climbing the relatively steep approaches to high-level bridges over the Cuyahoga River, and today the bridges carrying heavy traffic loads (the Innerbelt Bridge, the HOPE MEMORIAL BRIDGE, the VETERANS MEMORIAL BRIDGE, and theMAIN AVE. BRIDGE) are high fixed spans. There are more than 330 bridges in the immediate Cleveland area, including both the Cuyahoga River bridges and those spanning other features of the area’s mixed terrain and industrial complexes. When Cleveland was first platted, just before 1800, the east and west sides were joined by ferries, which were soon supplanted by the first Center St. Bridge. The Center St. Bridge was based on a system of chained floating logs, a section of which would be pulled aside to permit the passage of vessels. A later version of this bridge was based on pontoon boats, and ultimately on a succession of fixed structures. The first substantial bridge over the Cuyahoga appears to have been the first COLUMBUS STREET BRIDGE, erected ca. 1836, with a draw section permitting vessels to pass. The roofed bridge was 200′ long and 33′ wide, including sidewalks. In 1836, following the incorporation of both Cleveland and OHIO CITY (CITY OF OHIO), Cleveland ordered the destruction of its portion of the Center St. Bridge, which had the effect of directing commerce across the Columbus St. span, thereby bypassing Ohio City. Enraged Ohio City residents damaged the Columbus St. span and hostilities began. West-siders ultimately gained their point, retaining a Center St. bridge along with the Columbus St. span. With Cleveland’s annexation of Ohio City in 1854, traffic increases led to construction of the Main St. Bridge and the Seneca (W. 3rd) St. Bridge, and a rebuilding of the Center St. Bridge. In 1870 the Columbus bridge was replaced by an iron truss structure, which in turn was replaced by a 3rd bridge in 1895. The Seneca span collapsed in 1857 and was replaced first by a timber draw span, and in 1888 by a Scherzer roller-lift bridge–the first of its kind in Cleveland. The Center St. Bridge had a similar history, its wooden structure being replaced several times, finally with the unequal swinging span of iron built in 1900, which remained in service in 1993 as the sole swinging bridge in the city. By 1993, 4 great vehicular bridges provided high-level spans over the Cuyahoga Valley. They were the Veterans Memorial Bridge (opened in 1918), the Hope Memorial Bridge (1932), the Main Ave. Bridge (1939), and the Innerbelt Bridge (1959). Near the present Veterans Memorial Bridge may be seen the remains of one of Cleveland’s great historical bridge achievements, the SUPERIOR VIADUCT, opened with great fanfare in Dec. 1878. Its great west side stone approaches were joined with a swinging metal span crossing the Cuyahoga toward PUBLIC SQUARE and downtown Cleveland. The viaduct served until Veterans Memorial was opened in 1918, as a result of complaints about delays in vehicular traffic from the frequent openings that river traffic required. Originally known as the Detroit-Superior Bridge, Veterans Memorial was a 2-level structure, with streetcars utilizing the lower deck until their demise in the 1950s. When inaugurated, it was the world’s largest double-deck reinforced-concrete bridge. Planned as early as 1916 but delayed by World War I, Hope Memorial was opened as the Lorain-Carnegie Bridge in 1932. The bridge has a lower deck originally designed for rapid-transit trains and trucks, but never used. Four colossal pylons, with figures symbolizing transportation progress, were preserved as the bridge underwent a thorough renovation in the 1980s, at which time it was renamed the Hope Memorial Bridge to honor the stonemason father of former Cleveland entertainer Bob Hope. Planned as early as 1930 to replace the low-level Main Ave. Bridge, with its attendant traffic delays, the Main Ave. High-Level Bridge was opened in 1939, after a remarkably fast construction largely financed with PWA funds. The bridge is 2,250′ long; with approaches, it is more than a mile in length. Eight truss-cantilever spans of varying lengths constitute the bridge itself, with added bridgework at the eastern end joining the bridge to the lakefront freeway. Having undergone significant emergency repairs in the 1980s, the Main Ave. Bridge was closed from 1990-92 for a major rebuilding and renovation of the deck structure, sidewalks, and railings. The old CENTRAL VIADUCT, opened in 1888, stood approximately at the location of the Innerbelt Bridge (1959). The entire span consisted of 2 bridges of iron and steel placed on masonry piers. Originally the river was spanned with a swing section, which was replaced with an overhead truss in 1912. Closed in 1941, the Central Viaduct was finally replaced in 1959 by the Innerbelt Bridge, built with substantial funding resulting from the Federal Highway Act of 1956. The bridge is Ohio’s widest, and nearly a mile long, with the central portion consisting of a series of cantilever-deck trusses with a reinforced-concrete deck and asphaltic concrete driving surface. It serves to connect I-71 and I-90 West with the Innerbelt Freeway. Two other bridges built as part of the interstate highway system are the I-490 bridge, which replaced the Clark Ave. Bridge, and the I-480 bridge spanning the Cuyahoga through VALLEY VIEW. A substantial high-level rail bridge, the CLEVELAND UNION TERMINAL Railway Bridge, just south of the Veterans Memorial Bridge, carries 2 rail tracks and 2 tracks used by commuter rapid trains of the GREATER CLEVELAND REGIONAL TRANSIT AUTHORITY. Nearly a dozen movable bridges remained across the Cuyahoga serving both vehicular traffic and railroads in 1993. Among the vehicular bridges are the old Center St. Swing Bridge, the Willow St. Lift Bridge (over the Old Cuyahoga Channel between the west side and WHISKEY ISLAND), the Columbus St. Lift Bridge, the Carter Rd. Bridge, and the W. 3rd St. Bridge. The remaining lift bridges serve various railroads; some were actively used, such as the ConRail Lift Bridge near the mouth of the Cuyahoga–the first bridge up the Cuyahoga from Cleveland Harbor–but many remained in lifted positions in the 1980s in response to industrial declines in the Cuyahoga Valley and consequent declines in railroad traffic. The rail bridges included Scherzer roller-lift bridges, bascule structures, and jacknife bridges, in addition to lift bridges such as the ConRail structure. In addition to those spanning the Cuyahoga River, there are other bridges in Cleveland worthy of note. Architect CHAS. F. SCHWEINFURTH†, noted for his design of the downtown TRINITY CATHEDRAL, designed 4 unusually fine bridges that span Martin Luther King, Jr. Dr. (formerly Liberty Blvd.) inROCKEFELLER PARK. Structurally interesting in their combining of steel, concrete, and decorative stone, they include 3 vehicle bridges (Wade Park, Superior, and St. Clair avenues) and a railroad bridge (built for the Lake Shore & Michigan Southern Railway). Other noteworthy structures include the Forest Hills pedestrian bridge in nearby CLEVELAND HEIGHTS, the concrete-arch Monticello Bridge carrying Monticello Blvd. over Euclid Creek, the 1910 DETROIT-ROCKY RIVER BRIDGE (demolished 1980), the Hilliard Rd. Bridge over the Rocky River (1926), and the steel arched Lorain Rd. Bridge crossing Metropolitan Park near the Rocky River. Although a large number of engineers, designers, and architects, organizations, and consortia can be identified with recent bridge history in Cleveland, several individuals and organizations stand out. One of these is Chas. Schweinfurth, whose designs were referred to earlier. Another prominent designer and builder associated mainly with midwestern railroad bridges was AMASA STONE†, who, unfortunately, is often remembered for the tragic 1876 collapse of his innovative wrought-iron Howe truss bridge that spanned the Ashtabula River, supporting the tracks of the Lake Shore & Michigan Southern Railroad, of which he was president. Cleveland firms that have had prominent roles in the history of Cleveland bridges are Wilbur J. Watson & Associates–known for the 1940 Columbus St. Bridge and later for pioneering concrete bridge structures–and Frank Osborn’s OSBORN ENGINEERING CO., which began building local bridges at about the end of the 19th century. Another firm with historical prominence was the KING IRON BRIDGE & MANUFACTURING CO., which had important roles in the building of the Veterans Memorial Bridge, the old Central Viaduct, and the present (1993) Center St. Bridge. In the post-World War II period, the firm of Howard, Needles, Tammen & Bergendoff was heavily involved with bridges in Cleveland, as attention shifted away from building new bridges to rebuilding and rehabilitating existing structures. AVIATION. In the 1920s Cleveland emerged as a center for the early development of commercial mail and passenger flight operations, and since that time has become a focal point for the advancement of modern aviation and aerospace technology. Cleveland’s initial contact with aviation began during World War I when the federal government provided incentive for its development by introducing the delivery of mail by air. Just as Cleveland benefited from its position on the New York-to-Chicago railroad corridor, its size and strategic location fit ideally into a coast-to-coast route for airmail delivery from New York City to San Francisco. In 1918 federal officials began constructing a transcontinental system of navigational beacons or “guide lights” to initiate coast-to-coast airmail delivery, and Cleveland, aided by enthusiastic support from the Chamber of Commerce and local business groups, was chosen as one of the principal stops. The first regular airmail service as far as Chicago was inaugurated in mid-December of that year when planes piloted by U.S. Army flyers arrived in Cleveland, landing on a grassy strip in Woodland Hills Park near E. 93rd St. and Kinsman Ave. Planes on these runs carried 850 lbs. of mail (letters cost $.06 to send) and the flights experienced few major difficulties. The first truly transcontinental airmail trips in the nation began 8 Sept. 1920, with planes making their Cleveland stop at Martin Field, located behind the aircraft plant (seeGLENN L. MARTIN CO.) on St. Clair Ave. The U.S. government considered these makeshift fields unsatisfactory, and in 1925, CLEVELAND-HOPKINS INTERNATIONAL AIRPORT emerged when a team of city officials and Army Air Service personnel selected 1,040 acres at Brookpark and Riverside Dr. as the site for a new municipal airport. The much larger facility reflected good long-term planning, although the administration and passenger buildings did not open until 4 years later. The timing of this $1.25 million airport expenditure was ideal because in 1925 Congress passed the Kelly Act, under which the federal government turned over operation of its airmail routes to private parties through competitive bidding. Civil aviation was born, and Cleveland benefited from the entrepreneurial spirit of the early airplane owners. Not only did private contract flyers carry mail to various cities, mostly in the Midwest, but these fledgling businesses began to seek passengers as well. Ford Commercial Air lines inaugurated daily trips between Cleveland and Detroit on 1 July 1925, and soon Natl. Air Transport, a future component of United Airlines, launched what would become the first continuous service. Four thousand planes cleared the new field in 1925; in 1926 the total reached 11,000; and a year later, volume had grown to 14,000. Travelers bound for Detroit in 1929 made the 100-minute flight from Cleveland in a Ford tri-motor metal monoplane paying a fare of $18 one way and $35 round-trip. Airline personnel continually reassured wary passengers that air travel was safe, pointing out that planes, pilots, and mechanics were licensed by the Aeronautics Branch of the Dept. of Commerce and a rigid daily inspection of equipment was made. Aircraft landing was indeed made much safer after 1930 when Cleveland’s municipal airport installed the world’s first radio traffic system. General airport upgrading in the mid-1930s also made for better flying, and pilots favored the Cleveland field because of its relatively obstruction-free approaches. With the introduction of the improved Douglas DC-3 airplane in the late 1930s, the number of trips canceled by adverse conditions lessened significantly, making it possible for an airline to turn a profit on a flight without hauling mail. By World War II, 3 airlines, American, Pennsylvania Central, and United, dominated Cleveland’s commercial traffic. In the 1950s, 1960s, and 1970s, the greater dependability and faster speeds of the planes, the lower fares, and the decline in intercity railroad passenger service expanded the market for air travel. Both passenger traffic and mail increased, as did the number of flights for airlines such as Eastern, TWA, United, and Trans-Canada, which connected Cleveland travelers to the major cities of the U.S. and Canada and to international flights around the world. The most notable technological advance during the period was the advent of the jet engine and the rapid disappearance of piston-driven craft. Boeing 707 and Douglas DC-8 jets began to land at Cleveland Hopkins Intl. Airport, and in the late 1970s, the next generation of wide-bodied Boeing 747s and DC-10s regularly deposited passengers here. Only a few turbo-prop jets reminded passengers of the early jet age, and these craft belonged almost exclusively to small feeder lines such as the locally based WRIGHT AIRLINES, INC.. Massive improvements of Hopkins facilities were begun in 1973 involving a $60 million terminal-expansion plan which included rehabilitation of the west concourse and the longer runways needed to accommodate the jet age and the increase in passengers that it brought. While physical improvements at Greater Cleveland’s 3 airports were readily apparent, the traveler, after 1978, also recognized that airlines themselves were changing as the revolutionary process of deregulation by the federal government swept the industry in the late 1970s. Competition increased and so did mergers as fares were lowered to attract more passengers. In order to maintain profitability, trunk carriers reduced the number of flights or ended service outright in what was rapidly becoming an intense rivalry. In spite of the volatility, however, a number of new airlines entered the field, and in 1992 Continental and USAir were major carriers operating out of Cleveland’s municipal airport. Greater Cleveland had satellite airports as well. To relieve congestion, especially traffic generated by private aircraft, Cleveland’s downtown field, BURKE LAKEFRONT AIRPORT, opened in 1947 to provide ready access to the central business for travelers using their own or company planes or the regularly scheduled community flights. The other major landing strip at CUYAHOGA COUNTY AIRPORT on Richmond Rd. also served general aviation. Located in Richmond Hts., this field initially opened in the spring of 1929 when Ohio Air Terminals, Inc. acquired a 272-acre parcel for a flying school and related activities; however, it closed a year later after legal action was taken against the promoters because of airplane noise and danger. A pro-aviation climate after World War II prompted small-plane enthusiasts to win voter approval for the issuance of county general obligation bonds to rehabilitate the field. Although nearby property owners tried to block the plan, the Cuyahoga County Airport opened on 30 May 1950. Cleveland aviation involved transporting freight as well as mail and people. In Feb. 1936, the Railway Express Agency’s Air Div. started air-rail express service through an interchange agreement with Pan American Airways that linked Cleveland with cities on 20 American airlines and most of Latin America. From the mid-1930s on, the forwarding of express and freight increased steadily. After World War II, air cargo service frequently became part of the individual carrier’s Cleveland operation. American Airlines, for instance, inaugurated such service between Hopkins and 42 other cities on its far-flung system in Sept. 1946. More recently, freight-only air forwarders have served the community, including Federal Express and the Flying Tiger Line. In addition to the development of commercial aviation, Cleveland played an early role in the research and production of aircraft, beginning in 1918. That year inventor-entrepreneur Glenn L. Martin came to Cleveland and established a factory at 16800 St. Clair Ave. where he and his talented colleagues built the Martin MB bomber–acknowledged by military authorities to be superior in its class. The Martin-designed bomber, scheduled for quantity production when World War I ended, was produced here for the U.S. Army and Navy, for the Post Office, and for commercial use. Although Martin moved his plant to Baltimore in 1929, the GREAT LAKES AIRCRAFT CO. operated a portion of the former Martin facility until that company disbanded in the mid-1930s. Aircraft parts continued to be made here, however, by firms such as Cleveland Pneumatic Aerol Co. and Thompson Products (TRW). Cleveland returned to aircraft production during World War II, when the Cleveland Bomber Plant owned by the Dept. of Defense and operated by General Motors (GM) made the B-29 bomber adjacent to the municipal airport. Aviation research and development was also furthered by the NATIONAL AIR RACES, which were held here intermittently throughout the 1930s and from 1946-49. In 1929 the quality of Cleveland’s airport and the organizational skills of the Chamber of Commerce, together with support from Glenn Martin and Thompson Products, made possible the first aircraft races and the satellite aeronautical exposition. Although the races popularized aviation and were a source of civic pride, they were also important in advancing aircraft technology. Contests such as the Bendix trophy race from Los Angeles to Cleveland and the Thompson Trophy Race–a 55-mi. closed course marked by pylons–were proving grounds to test the airplanes’ durability and performance under extreme conditions. Cleveland’s stature as a research center was affirmed when the Natl. Advisory Committee for Aeronautics (NACA) established an aircraft engine laboratory in 1940. During World War II, its investigations included the problems associated with B-29 engines which were being assembled here by GM. Renamed the Lewis Flight Propulsion Research Laboratory after the war, the NACA facility conducted research to improve jet engine technology. In 1958 the Lewis Research Center became part of the Natl. Air & Space Admin. (NASA) and became actively engaged in the Mercury and Apollo space programs. Although aircraft production did not remain in Cleveland, the city retained a meaningful presence in the manufacture of airplane parts and the advancement of jet engine and aerospace research and development. Dawson, Virginia P. Engines and Innovation: Lewis Laboratories and American Propulsion Technologies (1991). Hull, Robert. September Champions–The Story of America’s Air Racing Pioneers (1979). Fordon, Leslie N. “On to Cleveland Race–1929,” in American Aviation Historical Journal, Spring (1966). Giblin, Ann M. “Aviation Enterprise, Technology and Law on Richmond Rd: The Curtiss Wright Hanger and the Cuyahoga County Airport,” in Journal of the Cuyahoga County Archives, (1983). Morton, Jan. “Cleveland’s Municipal Airport,” in National Municipal Review (1926). A second regional government is going through a makeover. Just as Cuyahoga County government has been remaking itself under new County Executive Ed FitzGerald after a major corruption scandal, the Cleveland-Cuyahoga County Port Authority is coming clean and rebranding itself under its president of one year, William Friedman. Last week, in unveiling a new strategic plan, the Port Authority officially signaled it was abandoning its ambitions to be a real estate developer on port land. Instead, it wants to be seen as a green agency that’s protecting the Cuyahoga River even as it refocuses on its business role as a dock operator on the Great Lakes. In short, it’s positioning itself to be the steward of the lakefront and the Cuyahoga. The changes come after a plan to move the docks to East 55th Street proved to be financially unachievable — or, as a new policy statement explains in a mea culpa, “overly ambitious.” The agency is refashioning itself a year before it must go back to voters to renew, and possibly increase, the small, 0.13-mill property tax levy that currently covers about 40% of the agency’s annual revenue, which totaled $7.9 million in 2010. “The Port Authority believes preserving the river channel and maritime industries are critical responsibilities,” Mr. Friedman reported to his board of directors last Wednesday, July 20. “We are prepared to lead that effort.” Later that day, in a meeting with the Crain’s editorial board, Mr. Friedman said the needs of the lakefront and the river channel are so great it could take $250 million over the next decade or longer to restore the waterfront infrastructure. That investment is needed to protect what the strategic plan calculates are 17,832 jobs and $1.81 billion in annual economic activity tied to Port of Cleveland docks and to private berths along the river. It’s likely the Port Authority would seek state and federal money to cover as much of the cost of this work as possible, though Mr. Friedman told the Crain’s editorial board the agency also could use its tax receipts.“The port’s tax levy is a pretty logical place to look,” he said. Mr. Friedman said money from the Port Authority’s levy could be used to support a long-term bond issue. But first, the Port Authority must beef up its cargo operations, which now are losing money and are subsidized in part by the tax levy. The Port Authority also is looking to broaden its domain and its relevance by positioning itself as the keeper of the Cuyahoga. It makes the case that maintaining the river as a navigable channel for shippers who bring bulk cargo up the river — such as the iron ore that is vital to the ArcelorMittal steel mill in the Flats — is a key factor in maintaining the health of the port. “I feel strongly that it is the right thing for the Port Authority as a matter of public policy to address the needs of the river,” Mr. Friedman said. Sections of the bulkhead that prevent the erosion of the riverbank are crumbling. In one section, this erosion has caused the closure of Riverbed Road because its base has shifted downhill. A landslide that breached the bulkhead could close the river to navigation. The new strategic plan formalizes a significant shift from the direction the port had been heading last decade. Five years ago the Port Authority was making headlines as a real estate wheeler and dealer, as it embarked on a bold plan to remake the waterfront east from the Cuyahoga River. It even went a step further and offered its development financing know-how to rebuild NASA Glenn Research Center. In part, the port’s real estate bent reflected the temperment of board chairman John Carney, a real estate developer who had seen the transformation of the Spanish port of Bilboa — an Atlantic port city smaller than Cleveland — while on a vacation/fact-gathering trip. He saw a similar opportunity in Cleveland. But the port’s vision collapsed as newly appointed board members balked at the growing expense of a ballooning staff and questioned the Port Authority’s ability to afford new, larger docks, forcing the abrupt resignation in November 2009 of Port Authority president Adam Wasserman.